I'm still not sure about this dual-screen laptop thing, but it's interesting to see more concepts come out of the woodwork. 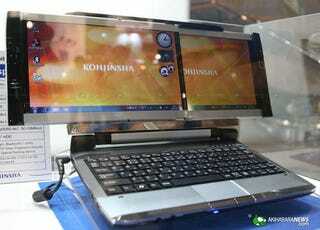 The latest is Kohjinsha's dual 10.1-inch screen netbook prototype, which is on display at the CEATEC show in Japan. Like Lenovo W700, one screen can slide behind the other if you don't need to use both. It's slightly thicker than a normal netbook, but the insides are pretty much the same: Windows 7, 1.6GHz AMD Athlon Neo MV-40 processor, maximum 4GB RAM, and 160GB hard disk. How battery life would be affected remains to be seen.